Whatever the Canadian Council of Chief Executives wants, the Canadian Council of Chief Executives gets. This organization of 150 top Canadian CEOs is the most powerful lobby group in the country. It has wanted deeper economic integration with the U.S. ever since it won the Canada-U.S. Free Trade Agreement battle in 1988. Now it looks like deep integration will happen and most Canadians will remain in the dark, just as the CEOs planned. The CEOs learned their lesson in 1988, when free trade became the election’s defining issue. Pro-free trader Brian Mulroney was returned to office with 43 percent of the vote, while the Liberals and New Democrats, both of which opposed free trade, garnered 57 percent. People voted against free trade, but they got it anyway. In recent elections the CEOs haven’t wanted free trade to become an issue the way it did in 1988. Such a debate could spiral out of control, as it did then. Better to negotiate deals in secret and announce them at the time of signing, when it is almost too late to stop them. That’s what is happening in early February 2011, as Stephen Harper and Barack Obama prepare to sign an agreement nobody outside of government has yet seen, except, perhaps, for CEO Council president John Manley and his American counterparts. Deeper integration was a signature policy of the George W. Bush administration. Canada, the U.S. and Mexico signed on to the Security and Prosperity Partnership (SPP) in 2005. This organization had five goals: eliminate the border, deregulate the economy, lock Canada’s energy resources into American needs, fashion a unified defence force and create a new institutional framework—governance by big business—for North America. The agenda moved forward rapidly even though the vast majority of Canadians opposed the SPP: 86 percent of Canadians wanted the SPP to be debated in Parliament, something business wasn’t going to allow. The three governments set up the Competitiveness Council comprised of business executives to advise them how to proceed. All ten Canadian representatives appointed by Harper were members of the CEO Council. With the election of Obama, the SPP was dead. But what the CEOs wanted hadn’t changed, except that they hedged their bets against a declining American empire by negotiating a free trade agreement with the European Union. They were still on board for deep integration with the U.S. It would just have a new name: “The New Border Vision,” which takes attention away from economic integration. “We intend to pursue a perimeter approach to security, working together within, at, and away from the borders of our two countries in a way that supports economic competitiveness, job creation and prosperity, and in a partnership…” The words are there, with a few additional words in between. You’ll also see the same old libertarian gang out in full force to back the CEOs. Alexander Moens, a senior fellow at the business-backed Fraser Institute, who was taken on by the institute to promote integration, was on the case, arguing the new deal on border security should be “celebrated.” Brian Crowley, head of the business-backed Macdonald Laurier Institute in Ottawa, travelled to Chicago, the Obama heartland, to convey the message that Canada is more conservative than Americans think. He delivered this message at the business-backed Heartland Institute, the Canada-U.S. Business Council of Chicago and the business-backed National Strategy Forum. The use of the words “our purposes” is interesting, given that they likely do not refer to the purposes of ordinary Canadians, but those of business. But the most effective defence of the unknown agreement came from the Canadian Defence and Foreign Affairs Institute (CDFAI), a Calgary-based organization that promotes Canada’s military machine. And behind the scenes are the CEOs. Under the leadership of new president John Manley, the CEO Council has developed a new method of operation so as to not be in the crosshairs of activist groups like the Council of Canadians. This involves working with groups that share common goals while remaining in the background. The CEO Council worked with the Canadian Chamber of Commerce to build support for corporate tax cuts. Now it’s working with CDFAI to build support among the elites for deep integration. CDFAI’s million-dollar budget is provided largely by the oil and gas industry and other corporate sources. Check out this organization and you’ll find some of Canada’s leading neoconservatives from the Calgary School: Tom “Assange should be assassinated” Flanagan, Barry Cooper, David Bercuson. You’ll even find the Fraser Institute’s Alex Moens here as a senior fellow. More important, you’ll find key figures from the free-trade battle of 20 years ago: Derek Burney, who was Brian Mulroney’s chief of staff and then his ambassador in Washington, as the Mulroney government pushed free trade forward. Robertson has pushed for deep integration with the U.S since 1985, when he was a member of the team that negotiated the free-trade agreement with the U.S. 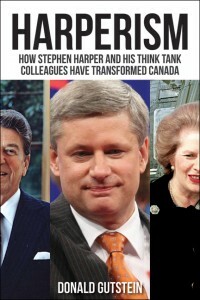 He helped draft the NAFTA-implementing legislation in 1993 and then became chief promoter of NAFTA in government. Not only do we need to worry about the thickening border, Robertson argues, we need “to take a blowtorch to the regulatory thicket and to strategically manage our shared environment and its resources,” reiterating the language of the Security and Prosperity Partnership. CEO Council president John Manley said he was encouraged the border issue seemed to be back on the agenda at the highest level. He should be. It’s his agenda. Posted in Integration with U.S.